Sometimes it can be hard to answer the question “how much will my pool cost” straight off the cuff. The reason for this is simple, each and every backyard is different and there are a number of things that can influence the over-all cost of a pool project. Take our most common pool for example; the 8.2 X-Trainer swimming pool. This pool can be installed, with pool lights and filtration equipment or around $35,000 but it is not uncommon for people to spend $50,000 or more by adding in extras like the vantage self-cleaning system, heat pumps and pool covers. As you would expect, the total cost of a pool installation increases with the size of the pool. This is not only because of extra materials used in the construction of your pool shell, but also because of the added work onsite. For example, your excavation and soil removal costs grow too. Generally speaking, it is fair to assume that you will need to budget between $3000-$5000 when upgrading from one size pool to the next. This may be one of the reasons of an increased popularity of our Plunge pools over the past few years. Most jobs are pretty straight forward, and even if you do have difficult access it doesn’t mean it’s going to cost an arm and a leg to come up with a solution. Poor access for diggers and soil removal trucks can make the job a little harder. The easier it is for your pool builder to get machinery (and your pool) onto site, the cheaper your pool project will be. Trickier jobs may require the use of a crane or other specialist equipment which can add to you total project cost. 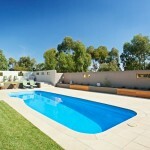 The most cost effective place to install a pool tends to be a flat area of your backyard. This is because you can minimise the amount of ground work/ landscaping that may be needed to create your ideal pool-scape. In the past, fibreglass pools have been limited to simple installations on flat sites. If you had a sloping site the only real option was to opt for a concrete pool. With the invention of Maxi Rib technology you can now put a Compass Fibreglass Pool anywhere from Hillsides to rooftops. Choosing a Compass Maxi Rib pool often works out much cheaper than opting for a complex-engineered concrete option. In fact some people report that the cost savings can be many thousands of dollars. Moreover, it allows us to build infinity edge swimming pools. In most cases the soil in your backyard will be more than fine for a straight-forward pool installation. In backyards where there is a high water table, soft or reactive soils, or rock beneath the surface, extra work is often required. It can be helpful to pass on any information you may have about the soil conditions in your backyard while working with your pool consultant. This will help you avoid any surprise costs further down the track. You could be forgiven for thinking that all fibreglass pools are made the same way. The truth is there can be a huge difference between one pool brand and the next. More expensive pool shells usually cost more for a reason. The most reliable and resilient resins for example can be two to three times more expensive that standard options. Added technology (such as the unique Compass Ceramic core) add extra cost but, enable you to enjoy greater peace of mind in the long run. Not all pools are created equal. In fact, we believe that the way you choose to look after your water is one of the most important decisions you’ll make throughout the process of buying your pool. You see, pools have traditionally been circulated using the industry-standard eyeball and skimmer system. This system is known to consume more power, require more chemicals, and demand more upkeep from pool owners. To help reduce ongoing running costs, (and make your pool easier to run and healthier to swim in) we have introduced two amazing pool operating systems to the market. The Vantage self-cleaning and circulation system takes away all of the hard work involved with looking after your pool. Not only does Vantage remove the need for manual cleaning (yes it really does clean itself! ), it also dramatically boosts circulation which prevents algae and bacteria growth. Another alternative to traditional circulation is our exclusive Logic system which is designed to slash power consumption and maximise circulation at the same time. Both of these systems may require an initial investment in the beginning, but they also have the ability to save you money and time for the rest of your time as a pool owner. As you can imagine, there’s a huge variety of optional extras that you can add to your pool package. From covers to heat pumps, water features and programmable LED lights. These days your options are almost endless, you can even choose to add automated systems which monitor your chlorine and pH levels and dose your pool with the necessary additives to keep your water balanced and safe to swim in. When developing your overall swimming pool budget you will want to not only plan for your base pool package but for all stages of your backyard pool project. This includes any optional extras (like heat pumps etc.) as well as surrounding landscaping options. In general terms landscaping may include pool fencing, concreting, paving, or decking to create and ideal surround for your pool area. The best way to get a clear understanding of what it will cost to put a pool in your backyard is to meet with a professional Pool Consultant. 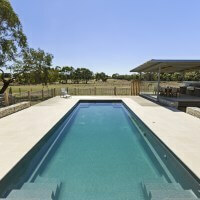 A typical consultation will involve getting a pool builder to view your site in person. They will then sit with you and thoroughly discuss your plans; during this conversation they will ask questions so that they get a true understanding of what will be important to you in the long run. Once they get a clear understanding of your needs, they will make a recommendation of what options will work best for you. If you agree they will then be able to give you a detailed quote to help you with your budgeting process. If you would like to arrange for a Compass Pools dealer to visit your home click here. Explore our swimming pools to choose the one that suits your requirements and explore pool design ideas.